Sometime last summer, I wrote a short piece of fiction on this blog, and one of the comments made about it was that it was vaguely reminiscent of Matthew Reilly’s novel Contest. Intrigued, I discovered that my local public library system had a copy, so I checked it out and started reading (however, I forgot to write a review until now). Actually, the novel was originally self-published in 1996 when Reilly was age 19. Then Cate Paterson, a commissioning editor from Pan Macmillan, found a copy of in a bookstore and subsequently signed Reilly to a two-book deal. Apparently, Reilly had success with later novels as well. 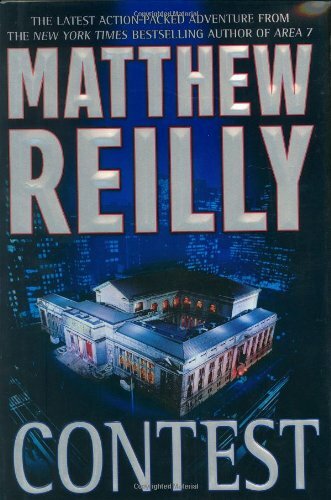 Reilly is an Australian, but he chose to set his tale in New York City, specifically the main branch of the New York City Public Library (which was featured at the beginning of the 1984 film Ghostbusters), and his main characters are New York natives, which is where he starts to get into trouble. Actually, I liked the book, but he introduced plot holes big enough for me to walk through, and he occasionally called things like the trunk of a car “the boot,” not keeping it straight in his mind that the people thinking these thoughts were American.